At the end of the 2017-2018 season, the Great Hall of the Athenaeum hosted the concert performed by pianist Elisabeth Leonskaja, along with the Philharmonic Choir and Orchestra, under the baton of conductor Horia Andreescu. Pianist Elisabeth Leonskaja held a concert in the Great Hall of the Romanian Athenaeum, on Wednesday, 20th June, accompanied by the 'George Enescu' Philharmonic Orchestra, under the baton of conductor Horia Andreescu. The first part of the evening's concert contained the piece entitled The Bells Are Due by Felicia Donceanu and the Concerto for Piano and Orchestra in A Minor by Edvard Grieg. The second part was dedicated to Symphony No. 4 in E Minor by Johannes Brahms. The Bells Are Due and the Cantata for Choir and Orchestra composed by Felicia Donceanu in 1999, on Edgar Allan Poe's lyrics was warmly received by the audience. This musical composition captures the character of Poe's poem, both from the sonic and the structural points of view; and it also processes its quadripartite form. Edvard Grieg's piano concert was offered to the public by Elisabeth Leonskaja, who managed to capture both the expressive character of the work and the stylistic ethos of Schumann's influence. Although it is one of the most popular works of the genre, thus being susceptible to superficiality, both the pianist's interpretation and her relationship with this musical piece have proved a profound understanding of its romantic aesthetics. "As usually, a magical interpretation, this time, for a romantic score, a volcanic interpretation, a wonderful interpretation that basically stirred the souls and exalted the hearts." - Music critic Costin Popa about the performance of pianist Elisabeth Leonskaja. Symphony No. 4 in E Minor by Johannes Brahms was performed during the second half of the evening, proving both the endurance and the technical ability of instrumentalists and of the conductor. From an expressive point of view, the overall effort is welcome, the risk being here, in the dynamic homogeneity. 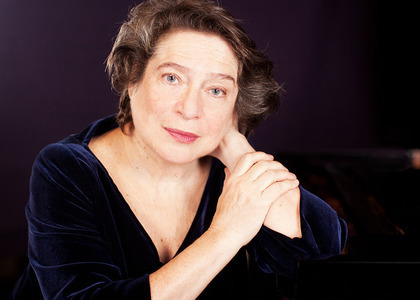 Along with the 'George Enescu' Philharmonic Choir and Orchestra, under the baton of Horia Andreescu, Elisabeth Leonskaja will present the same programme on Friday, 22nd June, 19:00, at the end of the season.